Bring 2 quarts water to boil in large pot. Add pasta and 2 teaspoons salt and cook, stirring frequently, until al dente. Reserve 1 cup cooking water, then drain pasta and return it to pot. Add remaining 1/2 teaspoon garlic, lemon zest and juice, reserved garlic-oil mixture, and reserved cooking water to pasta in pot. Stir until pasta is well coated with oil and no water remains in bottom of pot. Add basil, Parmesan and pine nuts, and toss to combine. Season with salt and pepper to taste. Serve, passing extra Parmesan separately. 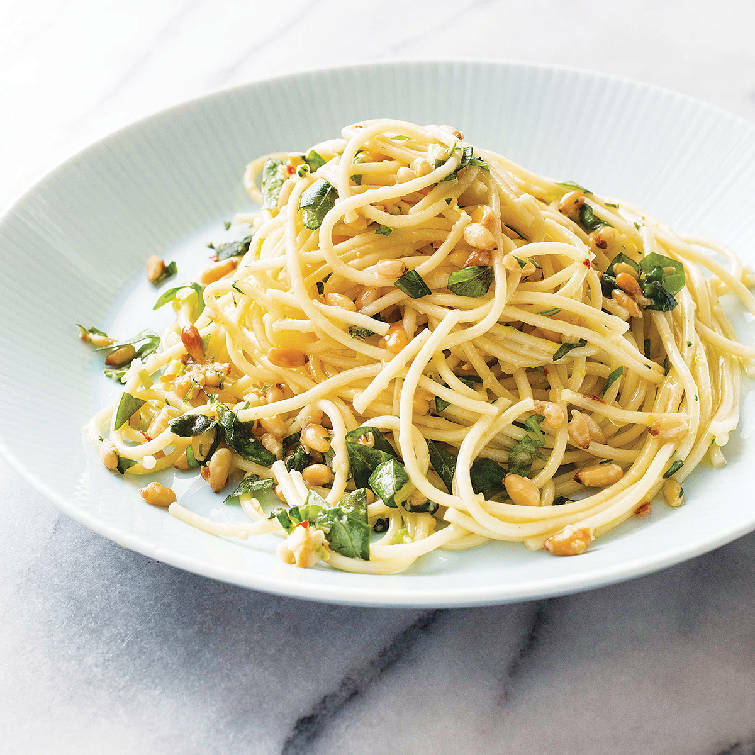 » Garlicky Spaghetti With Capers and Currants: Omit lemon zest, basil and pine nuts. Reduce lemon juice to 1 tablespoon. Stir 3 tablespoons capers, rinsed and minced; 3 tablespoons currants, minced; and 2 anchovy fillets, rinsed, patted dry, and minced, into pasta with lemon juice. » Garlicky Spaghetti With Green Olives and Almonds: Omit lemon zest and reduce lemon juice to 1 tablespoon. Stir 1 cup green olives, chopped fine, into pasta with lemon juice. Substitute Pecorino Romano for Parmesan and toasted sliced almonds for pine nuts. » Garlicky Spaghetti With Clams: Omit lemon zest and pine nuts. Reduce lemon juice to 2 teaspoons. Stir 2 (6 1/2 ounce) cans whole clams, drained and chopped, and 4 anchovy fillets, rinsed, patted dry and minced, into pasta with lemon juice. Increase Parmesan to 3/4 cup, and substitute 2 tablespoons chopped fresh parsley for basil. Nutrition information per serving: 720 calories; 271 calories from fat; 30 grams fat (4 grams saturated; 0 grams trans fats); 6 milligrams cholesterol; 426 milligrams sodium; 91 grams carbohydrate; 5 grams fiber; 4 grams sugar; 20 grams protein. For more recipes, cooking tips and ingredient and product reviews, visit www.americastestkitchen.com. 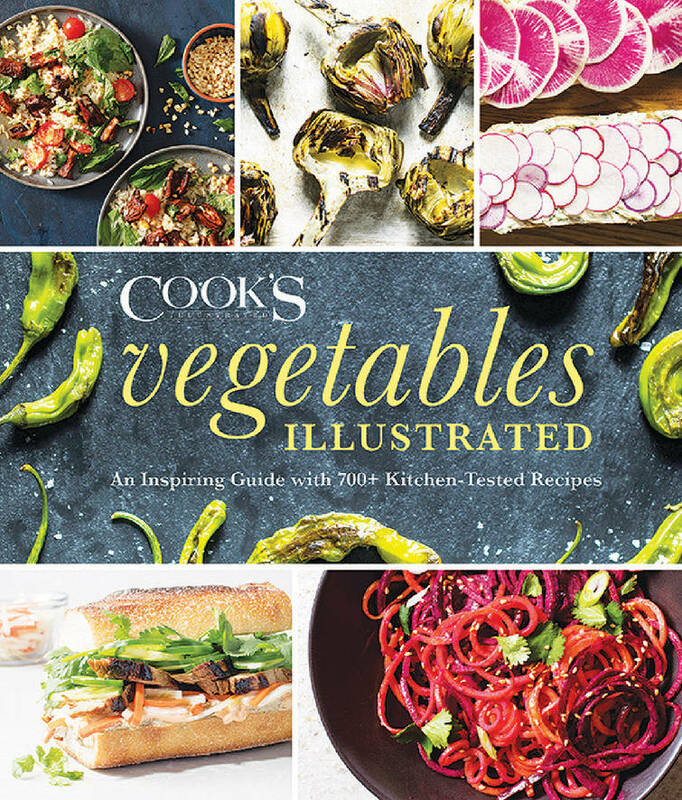 Find more recipes like Garlicky Spaghetti with Lemon and Pine Nuts in "Vegetables Illustrated."